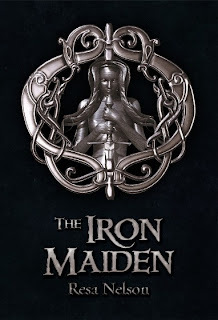 With The Iron Maiden, Resa Nelson continues to dazzle readers with her engaging story telling. Astrid, the new dragonslayer taking the place of her friend DiStephen, is off on a new and enlightening adventure. When Astrid's prize sword, Starlight, goes missing she's forced to travel outside of the familiar territory of Scalding. Her travels bring knowledge that women are not treated with respect as they are in the Nothernlands, from where Astrid hails. It's such a pleasure to see that the aptly named story's themes regarding women, appearance, and one's role in life continue in The Iron Maiden. Perspectives from new, and familiar, characters that are central to this story give greater insight into more of Astrid's world and the relationship between dragonslayer and dragon Nelson introduced in The Dragonslayer's Sword. The mystery is still flowing through this series and readers will be itching to find the answers to their and Astrid's questions. The fact that Astrid doesn't know everything about dragons, dragonslayers, and the history of Scalding territory does not detract from her strength and ability to make the right decisions. Astrid continues to grow as a dragonslayer and person. One can only imagine where her experiences will take her with the next story, The Stone of Darkness.